Musical Playwriting Contest ~ Philippine Freebies, Promos, Contests and MORE! The Ignacio B. Gimenez Foundation, Inc. is a privately owned institution founded to support the promotion of the arts, education, culture, skills, health and social growth within the Filipino society. They also design, develop, organize and finance projects in these areas to develop homegrown talent and display Filipino talent worldwide. 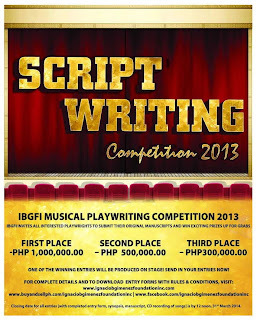 Now, they are calling all amateur and published writers to start writing their best scripts for the IBGFI Musical Playwriting Competition 2013. All needed forms can be downloaded on their website. Three (3) best playwrites will win cash prizes ranging from P300,000 (3rd Place), P500,000 (2nd Place), and P1M (1st Place). Not only that. One (1) winning manuscript will be played onstage in the future. Note: "You must attach your accomplished entry form to the first copy of your libretto. Do not write any contact information on the remaining nine (9) copies. These should be unnamed." "The winners shall grant and transfer to IBGFI all intellectual property, moral and publication rights to the story, including any translations, adaptations or modifications related thereto"